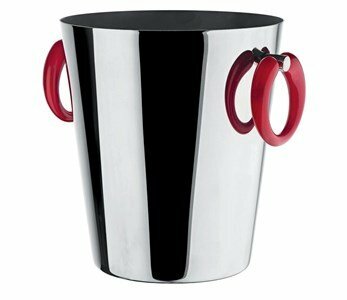 Simple, Mirri style, this ice bucket is super fun! The giant rings are a fun hint in a piece that breathes elegance. To use it, you must fill it with water and ice, then just start refreshing... Moon Bar is ready for all kind of bottles, even glasses and plastic bottles. It is also very easy to carry, due to the red giant handles. The cleaning can be done with tepid water, a smooth cloth and neutral detergent. Do not put it the dishwaher, and always dry it well before packing it up. Made of 18/10 stainless steel and the handles are in red thermoplastic resin.